I grew up with National Geographic. Every month I would thrill to the images and the story of the world, unfolding in comfortable glossy pages. Then there were my father's back issues, from his childhood, and his father's before him. Those were the pages where I learnt about the migration of the monarchs, how every third generation would fly for thousands of miles to flock together in warm groves for the winter. It never failed to amaze me how the map of the journey was imprinted on the fragile butterflies long insect generations before they began their flights. 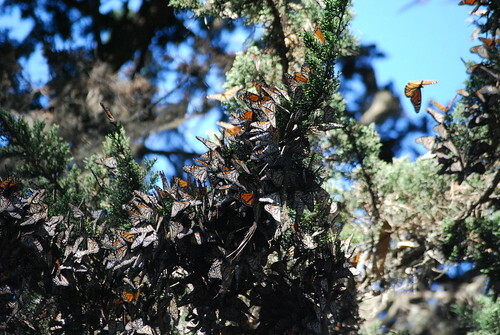 Last winter we visited one of the groves in Santa Cruz, but storms had pushed the butterflies out early and only a handful remained, fluttering around the eucalyptus. Slightly disappointed, we vowed we'd try again soon. 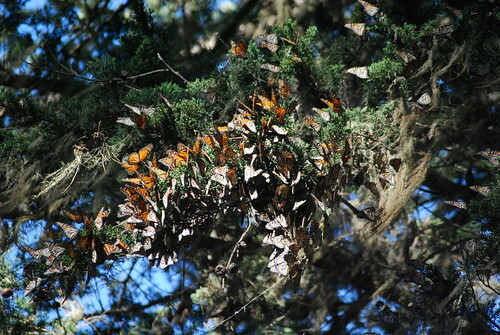 That's why, when we stopped in Pacific Grove for a night on the long drive from Las Vegas to Silicon Valley, we took a detour into the butterfly grove. 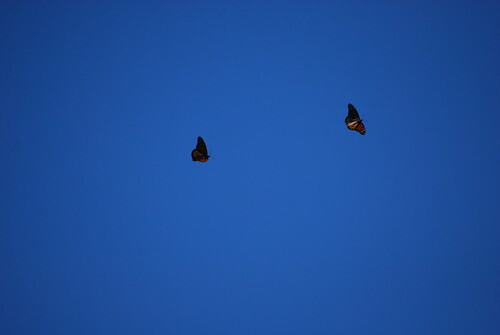 This time it was different, and there were tens of thousands of butterflies, huge orange and black winged giants, covering the trees. The conifers had wide brown leaves that fluttered and flashed their colours, dropping away for quick flights in the unseasonal warmth.